Leopold Blue was the first Contemporary novel I read this year, and it was very-different when compared to the books in this genre that I read in 2013. It dealt with politics, and other beliefs, as well as the equality between white and black people. South Africa, 1993, and Meg is a restless fifteen-year-old in the midst of smothering social and political turmoil. When your own mother is campaigning to educate people on how not to die, your own personal anxieties are belittled. Your life made trivial. Then Meg befriends Xanthe. Self-contained, rebellious and achingly cool Xanthe, and she begins to glimpse a life outside of her family. But by stepping away from her mother and into Xanthe's world, Meg is caught up in the chaos of adolescent longing and the pain of betrayal...And she soon realises that all that glitters is hardly ever gold. 'Leopold Blue' is set in a very important time in history; one that many young people are oblivious to, but should be reading about. This was a setting that was very prominent when reading Rosie Rowell's debut novel, especially after the recent death of Nelson Mandela, who was mentioned throughout the book. This was also a novel that not only tackled politics, and this was widely-discussed, but also the way that South Africa was changing during the 1990's and the belief that black people were not equal to those who were white began to end. Rowell writes this stylishly, perfectly capturing life in Leopold, a small-town that our main protagonist, fifteen year-old Meg, fears she will never be able to escape from. Meg is a character that will be familiar to all teenagers who pick up this novel, if not for the fact she has to deal with peer-pressure in her attempt to finally keep the friend she finds, endless arguments with her parents who keep her from 'fitting-in' and the jealousy she feels for a boy called Simon, who's A Grades have meant she has always been compared to him. Meg, when we first meet her, has no friends. She's restless. In a town that runs deep with family-history and ties, with beliefs and traditions that have been there for what seems like forever, Meg's mum makes it difficult for the family to be a part of the community. This was also another aspect of the novel that was an interesting look at the difference between our times, and the 1990s. Her mum has a different-outlook on Leopold, and is trying to campaigning to help people with AIDS, a life-threatening disease but, the town dislikes her for it. Whilst reading, you wonder why Meg is so critical of her mum's choice to try and save lives, but shockingly, something like this separates them from the rest of town. Xanthe is rebellious, outgoing and uncontrollable, and when she is seated beside Meg at school, after recently moving from Cape Town, its clear she is different from the other girls. Not scared of being the centre of attention, Xanthe is very much a force to contend with throughout this novel, and Rowell writes honestly about what it is like to show that you are 'cool' in front of your friends. We can all relate to the way Meg is desperate to keep the first friend she has had, and to follow-her into situations she would rather avoid. There's peer-pressure, and the need to simply 'fit-in' when Meg is used to not doing so. From missing a school class, to taking drugs and drinking under-age, our main character is willing to go-against those that she loves, including her younger sister, Beth, to not feel lonely again. There's jealousy, anger and upset; friendship, family and feuds. Rowell's debut is a coming-of-age novel that is all about finding-yourself and the pressures of being young. It does have some strong language, which does only make it more believable, and 'Leopold Blue' could have been made better by there being more of a background of life in South Africa, in 1993. The political-side of things is interesting and intriguing, but there were some parts I couldn't understand, as I have never looked at this period of history before. There's no doubt that other teenagers may feel this way. Some parts of this novel were slow-paced, but I could still relate to the characters throughout. 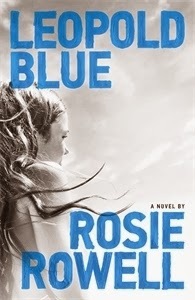 4 Stars to Rosie Rowell's Debut! Thank you to Hot Key Books for providing me with this review-copy, in exchange for an honest review! I've seen this a few times around the bookblogosphere and am beginning to really want to read it! Not many YA books being brought out these days focus on friendships, more romances so this sounds refreshing and different. I'm also really intrigued by the setting - I'd love to visit Africa one day so reading a story set there would be awesome! You really should - have you thought about getting a review copy? I completely agree; I love reading about friendships more than a romance, and yes, the setting is so interesting! Leopold Blue did make me want to visit Africa! I definitely agree that it's important to have YA novels set in South Africa in this time period - young people need to know about it. I was talking to my sister (who's the same age as you) about Leopold Blue a few days ago and she'd never even heard of apartheid! (I may have to get her to read this...) While I was shocked, I could also understand how she didn't know what it was because these things aren't taught in schools, which I really think they should be. Anyway, glad you liked this too! I'm not surprised young people don't know much about apartheid at all - I hadn't before Nelson Mandela's death - when I wanted to know more about such an inspiring man! I hope there are more books about South Africa out-there, as you said, young people should know about it. This looks really good! And the cover is gorgeous! I've seen some pretty good reviews on this book. I might read it when I get time. Thanks for the great review!